The other week I noted the current state of level crossing removals across Melbourne, and that Glen Huntly Road / Glenhuntly Station  isn’t on the list. This used to be my home station, and with about a million boardings per year , it’s the busiest on the Frankston line south of Caulfield, apart from Frankston itself. The locals know the trains (express or stopping services) crawl slowly across the tram square. The train is slow enough that when I walked from the back of the train, right along the platform, I still had to wait to cross the tracks at the other end of the station. I’m a reasonably fast walker, but trains should be faster. This low speed affects every train on the Frankston line, as well as delaying trams and pedestrians. 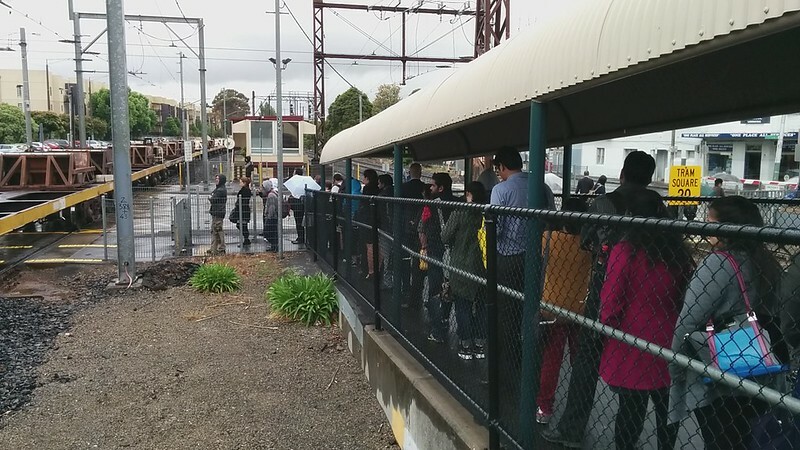 As I’ve noted before, it’s even worse when freight trains rumble through, and/or during peak hour when large numbers of people have to queue to exit the station. Because of the tram tracks, about every ten years the crossing requires expensive renewal works to maintain even this low speed. Thankfully this is one of only three remaining tram/train crossings in Melbourne. The others are at Kooyong (Glen Waverley line) and Riversdale (the relatively quiet Alamein line). The fourth, at Gardiner (Glen Waverley line) was removed during 2015-16. The level crossing removal program seems to be popular. I look forward to the next tranche of crossings being added to the list for removal next decade. I hope this will be on it. The road is Glen Huntly Road, named for a ship that arrived in the bay in 1840. From 1882 to 1937 the station name matched, but was modified to Glenhuntly in 1937. The PTV train station patronage stats look doubtful, which is why I haven’t used them much. For instance they indicate that patronage at Frankston station dropped by about half between 2009 and 2013. This seems highly unlikely to me. I wonder if there has been a methodology change, or if there’s some other explanation. There is a reason Glenhuntly & Tooronga were left off the list. Not that it’s been made public. Any ideas apart from politicalical. Glenhuntly has to be Skyrail due to the underground river near Caulfield Racecourse. Car parks were also expanded at Chelsea since then. Myki was introduced as opposed to Metcard which could habe changed the methodology (Stony Point Passengers previously might have been counted as boardings, rather than transfers). And then there’s always the chance that people driving started going to Cranbourne line stations rather than Frankston? Hmm..
Is it possible to get off the train at Riversdale and run to Williston and rejoin the train? @Steve, that sounds like a good challenge! I’d do Willison to Riversdale, because going the other way you’d need to cross the track twice to get the fastest route. It’s about 600 metres, and the world record for running that distance is about 75 seconds, so a regular human might be able to do it in double that perhaps? Next question: touch-off/on, or not?? That single point of entry/exit ramp , opened in 1987, is ludicrously inadequate now. At peak evenings the line to exit the station sometimes stretches back up onto the platforms. The recent works to widen footpaths and alter the traffic lights seem to indicate that the station well down the list for Grade Sep.
One good way to work out “how hopeless is your local bus route” is if you can get off the bus, go for a walk to another point on the route, and re-board the same bus. Sadly I think there’s quite a few bus routes in Melbourne where this is possible! I’m pretty sure the road was Glenhuntly, now changed to Glen Huntly. The station is Glenhuntly, the P O and suburb, Glen Huntly. Crazy. There is also a train/tram level crossing near Royal Park station on the Upfield line. However, nobody would consider this a priority for grade separation. The speed at Riversdale is 30 km/h Good luck running from Willison to Riversdale as the train route is over 100 metres less than what you’d have to run :) The crossing could be rail under but so would Neerim Rd at the same time, ppl carrying on about the water table look at what was done at the next station (Ormond) it is achievable. Have heard this talk re high water table at Glenhuntly often. Is their any factual evidence to support this claim? Is the information publically available? Reason being is that south end of Caulfield racecourse is highest point around the area and ground is flattish in racecourse then falls away from Dandenong rd to Gardiners creek while rail line falls from Glenhuntly station towards Patterson Bentleigh where Elwood drain starts. Anyways I thought that rail under would work well and area above intensively redeveloped….provided works yard is no longer required or can be relocated. Road access to developments already exists on east side between Glen Huntly rd and Neerim rd. You can briskly walk from Flinders St to Parliament stations in the same length of time as an outbound city loop train would take. As this is the busiest tram/train level crossing, including 25 peak period express trains, it should be be a priority for abolition. It should have been abolished years ago, like Glen Huntly Rd, Elsternwick was in about 1959/60. Can confirm the water table under Glenhuntly station is pretty close to the surface and would make rail-under highly complicated. Having said that, I don’t know where you would find soil-sample data online, though I imagine it would be available somewhere. Caulfield Racecourse was part of a large swamp system before they started to drain it from the 1850s onwards. It was called “Paddy’s Swamp” and stretched in a series of marshes from Caulfield Park (almost Hawthorn Rd) in the west, through the present racecourse in the east, and south to the present-day Glenhuntly Rd and beyond. Whilst the surface water is now gone, and there are various ridge sections, the sands underneath still bear a lot of watercourses. Middle of Caulfield Racecourse gets boggy still. At least one of either the new Ormond or Bentleigh stations (I forget which) is now below the water table, and had to be poured in one single slab of concrete weighed down, to stop the new station from floating upwards from the water pressure. It’s not an ideal situation engineering-wise. Why do the trains need to cross at such slow speeds? Can anybody provide me with a fact, of which can stand up? The overhead wire and different voltages does not fit, as the overhead in the crossing is set to the railway voltage anyway. Glenhuntly tram crossing used to be a dual speed crossing. Previously it was 30 or 35 for passenger trains and 20 for freight. This was prior to the upgrade of the tram square. Once that was completed they dropped the speed to 20km for all rail traffic claiming issues with signalling or something, it was supposed to be fixed but never has been. The train to Frankston used to be quicker than driving there. Due to road improvements, it no longer is.